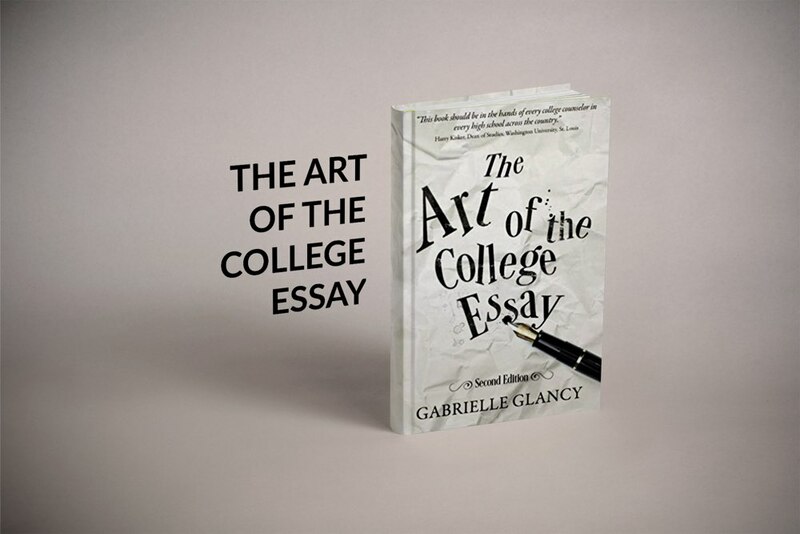 This bestselling guide for students, teachers, parents and college counselors, The Art of the College Essay will help you every step of the way — from staring at a blank page to writing the best essay you’ve ever written in your life. 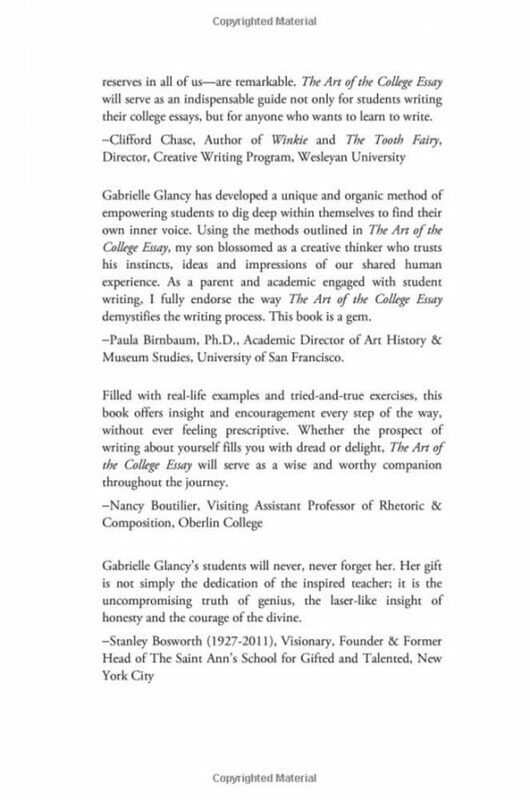 “You can do this,” Glancy tells us. 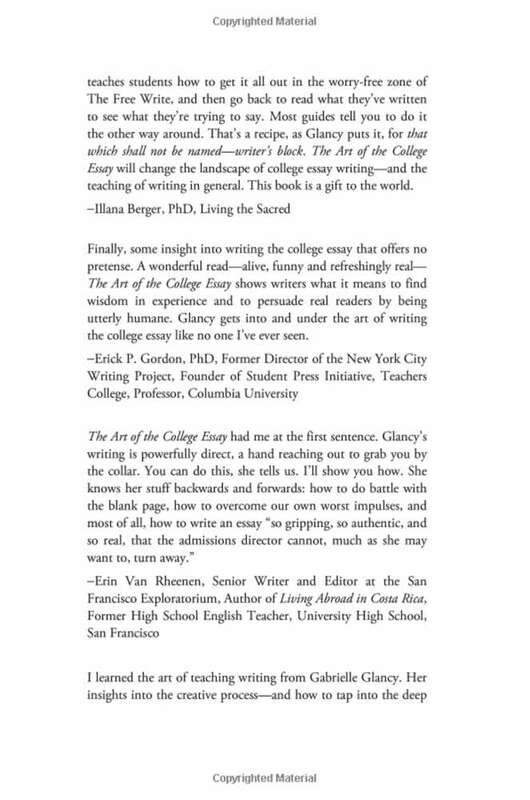 “I’ll show you how.” Face-to-face with a blank page and the pressure of writing the most important essay of their lives-the college essay-students often encounter what successful writing coach and college admissions expert Gabrielle Glancy refers to as that which shall not be named-writer’s block. 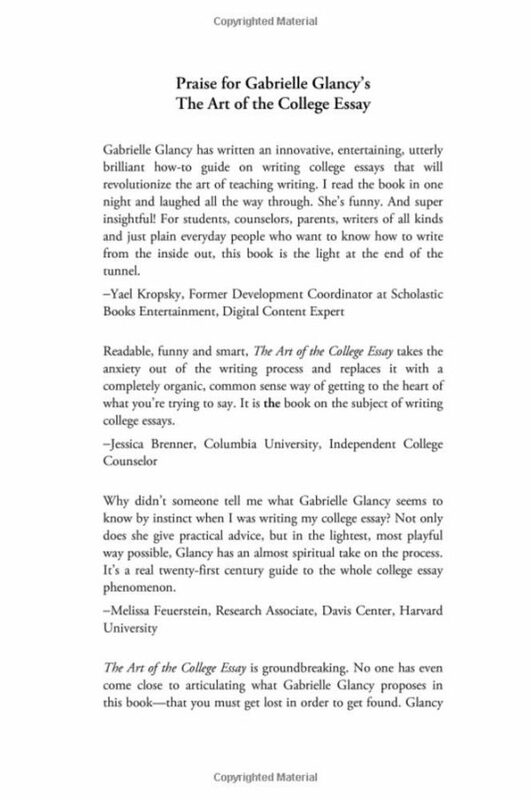 “Everyone tells you what you should do-tell a story; start in the middle; show don’t tell-but no one tells you how to do it,” Glancy explains. Using examples from essays that got students into the colleges of their choice, The Art of the College Essay shows what makes great essays great-and then tells you how to write one. Glancy provides a clear, highly readable, student-tested guide to writing college essays that are so powerful-so gripping, authentic, and real-that the Ad Com can only say yes. 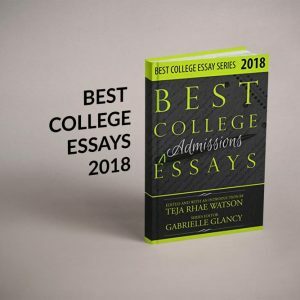 Helpful appendices list up-to-date college essay prompts, winning adjectives, grammar tips, trouble-shooting suggestions, and a step-by-step breakdown of the process. What a relief! 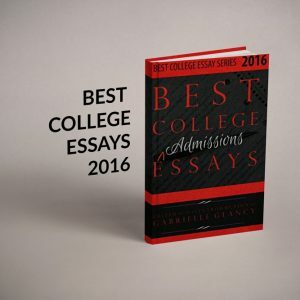 This book will get your son or daughter through the stress and anxiety of writing their college essays. Now I know why so many friends recommend it. It’s a big help! Glancy’s book is all you need to write a winning college essay. She takes you through the steps in a way that’s fun and easy — and makes sense. This book is short, interesting and will help you get the job done with less time pulling your hair out! Thank goodness these beautiful essays are seeing the light of day! Many of them moved me to tears – and they all inspired me.